I really hope that you make it a habit to warm-up before every exercise session even if it takes you less than 5 minutes to do it. Frankly, doing warm-ups may seem mundane, but it can save you from a world of pain later on. Remember ‘No Glory, No Pain’. Before starting any exercise activity, it is recommended that you engage in some kind of warm-up exercises for a minimum duration of 10% of your expected total exercise duration. For example, if you are going for a 60-minute ride on your bike, then you should do 6 minutes or more of warm-up exercises. 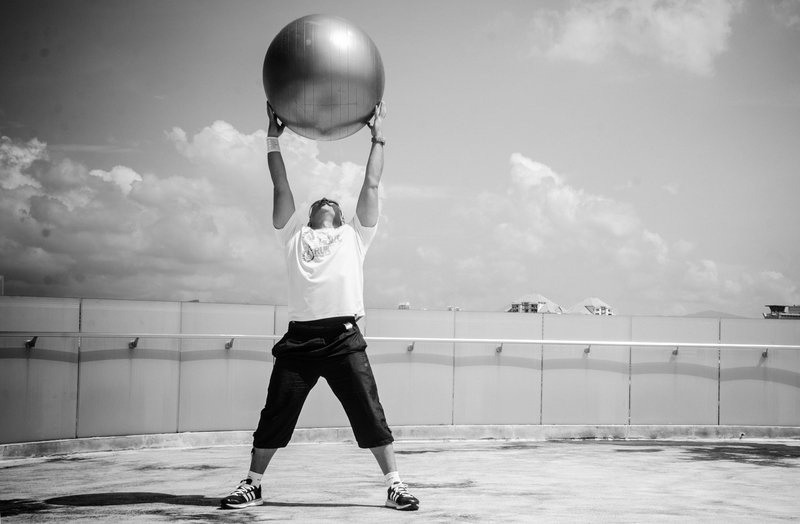 If you are planning to do gym ball exercises for 30 minutes, then you ought to warm-up for 3 minutes or more. Gradually warming-up your body and muscles by 1 degree centigrade before exercising or cycling will help you reduce the risk of bodily or muscle injury as a result of your heart rate increasing too fast and/or by inadequate circulation of blood-flow in your body. When you warm-up, it improves your blood circulation which in turn, will give carry more oxygen to your muscles when it is needed. Apart from gradually firing-up your muscles, warming-up is a great way to psyche yourself up for the activity ahead, and when you are better mentally prepared and focused, it will lead to better performance. Regardless, if you are a professional athlete or a novice cyclists, warming-up is the first key step to achieving effective results. Now, we come to the fun part of you trying-out some of my favourite warming-up routines listed below, and the best part is that you can do them anywhere, anytime, solo or with a partner. Stand upright looking straight ahead with chin-up. Hold ball against your crotch with both hands hanging relaxed on either side of the ball. From this starting position, exhale slowly and evenly as you slowly bend both knees, and at the same time lifting the ball over your head. When you are at the full squatting position with both feet always planted firmly on the floor, inhale and start straightening your knees, and at the same time, bring the ball back down to the starting position. Remember to tighten your abdominal muscles and keep your back straight and eyes fixed to the front throughout the whole exercise. Focus on your legs and arms as you do this. Make sure you squat down as low as you can until you feel your leg muscles burning. If your knees are going beyond your toes as you squat, then you need to widen your leg stance until your knees stay behind your toes. Do 10, 20 or 30 repetition at a time according to your fitness level. Repeat for a second set of the same number of repetition. Stand upright in the neutral position with your legs hip-width apart holding the ball in front of you with both hands. Use your right hand and start bouncing the ball on the spot for 30 seconds, and them bounce the ball using the left hand for another 30 seconds. You can start with the bounce height of the ball at waist-high and increase it to shoulder height. if you have enough space, you ought to try bouncing the ball in front or beside you as you run up and down the room. Make sure that you use both hands equally to bounce the ball This will not only warm you up but it is also a great way to maintain good hand-eye coordination. Never forget to regulate your breathing throughout every exercise by exhaling and inhaling deeply, smoothly and evenly. Always check that the floor surface is clean and smooth before bouncing the gym ball on it. No matter how clean the floors are, always wipe the gym ball clean with a damp cloth after every use for good gym ball maintenance. Stand in the neutral position and face your exercise partner and keeping a distance of 5 feet apart. Your partner catches the ball at chest height, and throws the ball back to you. Repeat this 10 times. Then both of you take one step back and throw the ball back and forth for another 10 times. Keep increasing the distance between you and your partner as long as both of you can throw the ball far enough. Remember that the further the distance between the partners, the higher the trajectory of the ball must be. Stand in the neutral position with your back facing your exercise partner’s back, leaving a 1 foot gap in between the two of you. Hold the ball in from of you above the waist. Turn your upper body to the right and pass the ball to your partner who in turns, will receive the ball on their left side. Keep the lower body (everything below the waist) fixed facing the front at all times. Your partner then turns his upper body to his right and pass the ball back to you form his right side. You will receive the ball from your left-side and repeat the routine for 10 repetitions. Then, reverse the direction of passing the ball and repeat another 1 or 2 sets for 10 repetitions. You can pass the ball faster to each other to really get your blood flowing. 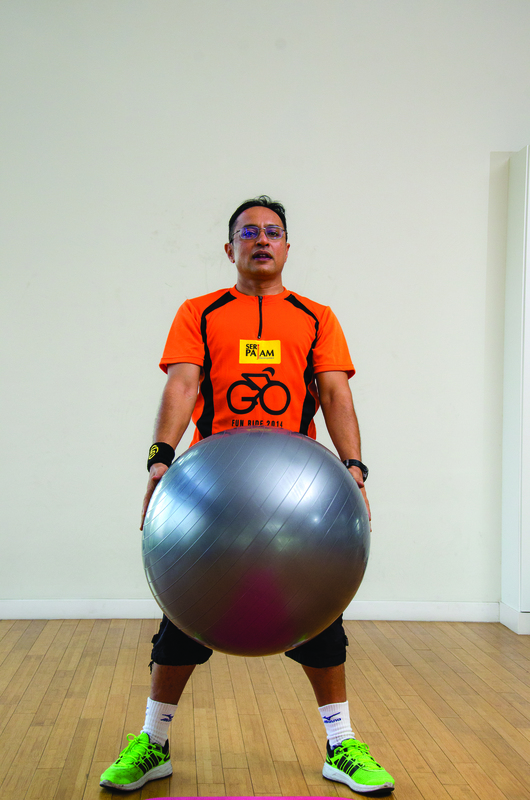 Before the start of a cycling event, you will not have the gym ball handy. So, here are two simple and effective warm-up exercises you can do easily before that MTB jamboree or that century ride. Stand upright with legs together and both arms straight at your sides. In one swift action, jump and spread your wide legs sideways. At the same time, lift your arms to the side and clap your hands directly over your head. Immediately jump and bring your legs back together and simultaneously, bring your arms back to your sides. Exhale as you clap your hands and inhale as you bring your arms back down. Repeat 20 times until you can feel your heart rate starting to beat faster. As the name implies, you are running on the spot. Keep your knees high, back straight and move your arms vigorously front and back, mimicking your running form. Do this for 30-60 seconds per set, and repeat for 1-2 sets until you feel your body temperature increasing. This entry was posted in 2016, Coach, exercise, Fitness, Gym Ball, health, Lifestyle, tips and tagged Active, Coach Gus, exercise, Fitness, Gym Ball, lifestyle, tips, Warming-up. Bookmark the permalink.